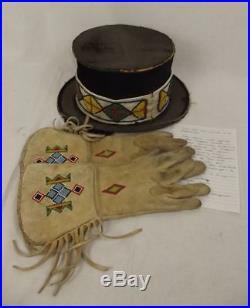 Pair Of Native American Indian Gloves & Hat From Buffalo Bills Wild West Show Here we have a piece of American showmanship Wild West History dating to circa 1904. 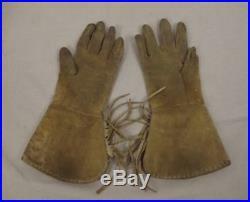 The pair of gloves were worn in the Buffalo Bill Wild West shows of the early 1900s. 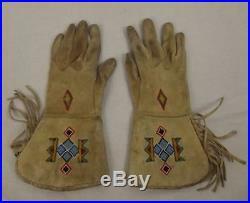 The gloves are of cream coloured suede leather with native American bead work and have leather tassels along one side. There are of course a ladies size. 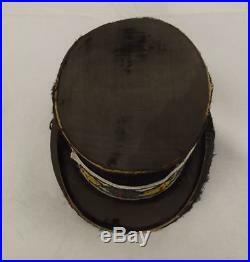 The top hat has a black, brushed silk exterior. 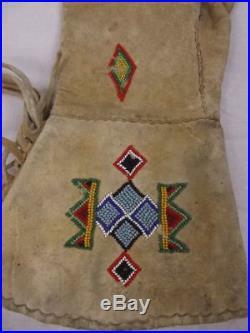 It would have most likely been worn by a native American as part of the troupe. 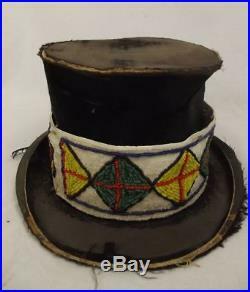 It has a white leather hat band, also with brightly coloured bead work. The hat has no lining. 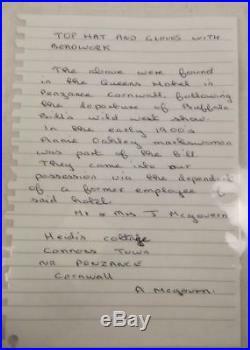 The items come with a letter of provenance stating that these items were left behind in the Queens Hotel in Penzance (Cornwall, United Kingdom) after the departure of Buffalo Bills Wild West show in the early 1900s and that they had been the property of a former employee of the hotel. The shows toured extensively all over the world at this point and most definitely stopped in Penzance, Cornwall so this is most likely to be from the show of May 30, 1904. Dimensions The hat measures on the inside 7 ¾ inches (20cm) by 6 ½ inches (16.5cm). The brim measures 10 inches (25.5cm) by 8 inches (20.5). The hat has a height of 5 ¼ inches (13.5). The gloves measure 13 ½ inches (14.25cm) in length and 4 ½ inches (11.5cm) wide across the palm. Together they weigh 238g. Condition The gloves are in sound condition but rather grubby and worn and missing a few beads on the left hand. The hat is rather worn with many parts of the brushed silk being patchy and bald. There are some small tears in the hat. The leather head band is in good condition with not too much wear. Buffalo Bill’s Wild West’Buffalo Bill’s Wild West’ was a circus-like attraction that toured all over the world in the late 1800s and early 1900s, performing to both the general public and Royalty and heads of state. The shows featured outstanding and very famous performers in their own right such as Sitting Bull, Wild Bill Hickok, Lillian Smith and Annie Oakley. The shows included feats of sharp shooting, riding skills and performers re-enacting the riding of the Pony Express, Indian attacks on wagon trains, and stagecoach robberies as well as to name but a few. Annie Oakley was famous for her sharp shooting, her most famous trick was her ability to repeatedly split a playing card, edge-on, and put several more holes in it before it could touch the ground. Buffalo Bill was a supporter of Native Americans rights. He employed many Native Americans, as he thought his show offered them good pay with a chance to improve their lives. Buffalo Bill also supported the rights of women. He said, What we want to do is give women even more liberty than they have. Let them do any kind of work they see fit, and if they do it as well as men, give them the same pay. The item “Pair Of Native American Indian Gloves & Hat From Buffalo Bills Wild West Show” is in sale since Monday, March 16, 2015. This item is in the category “Collectables\Memorabilia\Circus & Fairground”. 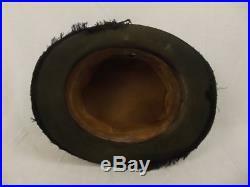 The seller is “theantiquesstorehouse” and is located in Portsmouth, Hampshire. This item can be shipped worldwide. This entry was posted in pair and tagged american, bills, buffalo, gloves, indian, native, pair, show, west, wild.